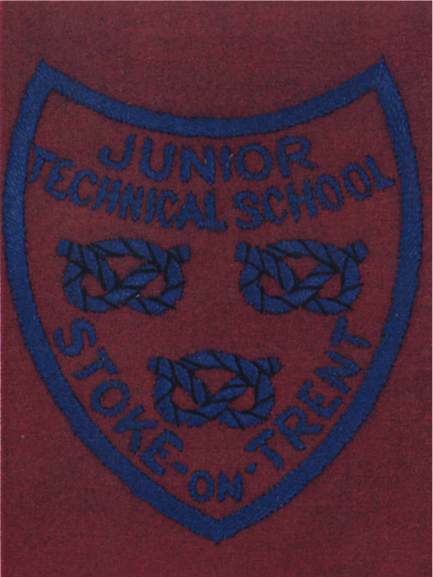 The JTS jacket badge The Junior Technical School took its intake at 13+ in January of each year and each pupil stayed until December of the following year. This extract is taken from the "Official Opening" programme for the final move to the High Lane complex in 1960. The School was originally established in 1932 under the leadership of the late Mr. James A. Collinson as a Junior Technical School, in premises in Moorland Road, Burslem formerly used by the Haywood Hospital. Four forms were admitted in September 1932, and four more the following year, giving a total of 192 boys taking a two year course. The age of entry was 13+, and the school prepared boys for entry to craft apprenticeships in the engineering industries. By 1939, the school had become well established and there was a steady demand from industry for boys who had received their education there. Many of the Old Boys of the earlier years served in the R.A.F. and R.E.M.E. in World War II; twenty five Old Boys of the school died on active service. In the school itself, boys and staff produced small parts for tanks. The cap badge is in mint condition from 1950. Ray Bagnall explained that he lost his cap when he put his head out of a railway carriage while trainspotting. The replacement badge was never used. There is a Roll Of Honour Board in memory of those old boys killed in action in the Second World War located in the High Lane Assembly Hall. We have also collected a fascinating amount of information about the history of the Moorland Road school building. "I shall always remember that Mr Taylor's favourite comment was "I've taught you all I know and now you know nothing". How right he was, but he was a very good magician. I remember after playing football (where Port Vale now is) we all had a good hose down with a stirrup pump (full jet not spray) to get the thick of the mud off." Burslem JTS 236 Squadron ATC This picture comes from the same archive as others in this set discovered by John Whitmore. Several of the adults seem to correlate with the parade picture in Moorland Road hall. 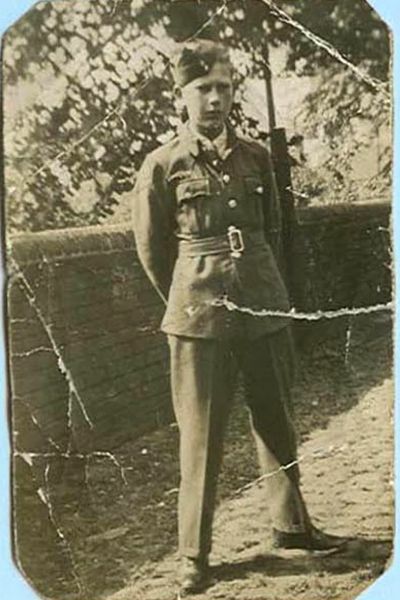 "The photograph must have been taken in 1939 and it is indeed The Burslem JTS, 236 Squadron ATC. 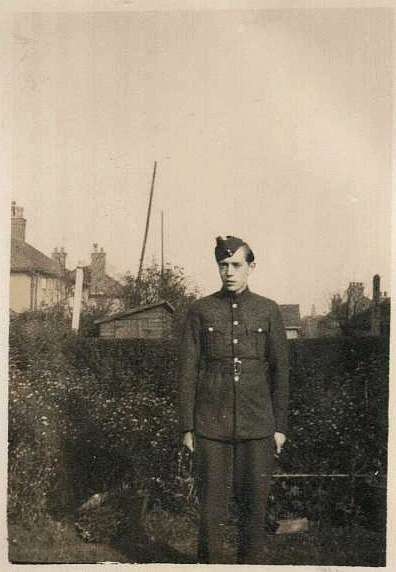 Looking at the Photo., I am on the left of the Cadet who is sat in front of Mr.Collinson. 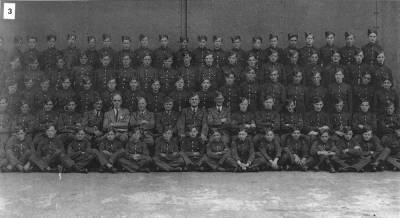 The Hanley High School Squadron was 235 and they later moved to their new school at Chell. The other Squadrons in the City were Stoke (237) and Longton (238). I don't know all the Senior Gents in the Photograph but one looks like Mr.Potts and another like Mr.Mills. The Photograph, if my memory serves me rightly, was taken in the playground of Moorland Road School, which is where we used to do our "square bashing"." On the web site you mention Mr Potts was Maths - he did not arrive/return until 1946 after I left, Mr Taylor (not Geography) was Maths, Mr Potts became Head after "Collo". Mrs Tucker I feel sure arrived early in 1945. Here goes :- Billington, Bowyer, Chadwick, Colclough, Cooper, Cooper, Davies, Deakin, Downing, Edge, Farr, Garside, Hargreaves, Heath, Jarvis, Lambert, Llewellyn, Lowe, Nut, Scragg, Scrace, Scriven, Smith, Tweedy, Wedgewood, Wood, Yates. During 1945 I was a member of 236 A.T.C. Cadets, however "Collo" sacked me for not attending an important Sunday parade in Burslem. I couldn't tell him that the reason was an older cousin, who occasionally let me put my hands inside her bra, had invited me to go to Trentham, expenses paid, I knew what that meant. I spent my National Service in the R.A.F. (S.A.C. Radar Mechanic)."